Two colorful, eight-legged cephalopods, known as cuttlefish, recently graced the cover of the journal New Scientist. With bluish-green blood, iridescent skin color, feeding tentacles that shoot from their mouths like birthday party blowers, and eyes like something from a Batman movie, it is no surprise that the editors of New Scientist used the term “alien” in its description of the cuttlefish; the animals do look bizarre—plain and simple. Make no mistake, however, these creatures are anything but simple. In fact, just above the cuttlefish was the cover title, “Alien Intelligence: Secret Code of an Eight-Legged Genius” (Brooks, 2008, emp. added). Michael Brooks, author of the feature article, declared that the cuttlefish is “the world’s most inventive mollusk” (2008, 198:31, emp. added) with a “sophisticated system for talking to one another” (p. 28, emp. added). Scientists have documented “around 40 different cuttlefish body patterns, many of which are used to communicate with other cuttlefish” (p. 29). At other times, cuttlefish send “tailor-made” signals to predators (p. 29, emp. added). 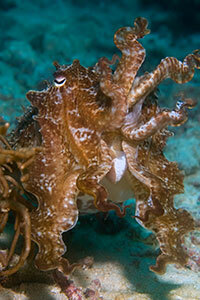 Even more incredible than their communication skills, is the cuttlefishes’ ability to blend in to their surroundings. Brooks described them as having “the world’s best camouflage skills” (p. 29). Similar to how these mollusks (cuttlefish have an internal shell called a cuttlebone, thus, scientists classify them as mollusks) communicate with other animals via a variety of body patterns, they also move their bodies into a variety of positions in hopes of staying hidden. For example, while swimming next to large seaweed, a cuttlefish can mimic the grass’s motion by positioning and waving its eight arms in a similar way that the seaweed sways in the water. This makes it very difficult for both attackers and possible prey to locate the cuttlefish. In a recent study, scientists placed either horizontal or vertical stripes on the walls of cuttlefish tanks. How did the cuttlefish react? According to Dr. Roger Hanlon, “If the stripes were vertical they would raise an arm. If the stripes were horizontal they would stretch their bodies out horizontally” (as quoted in Brooks, p. 31). Amazing! Cuttlefish can even change the texture of their skin to mimic the shape of certain barnacle-encrusted rocks or corals. Finally, what must give other sea life more problems than anything is the cuttlefish’s ability to change color—and to do it so quickly. A cuttlefish can change the color of its entire body in the blink of an eye. If this mollusk wants to change to red, it sends signals from its brain to its “pigment” sacs (called chromatophores) to change to red. Cuttlefish can hide from other sea life by changing to the color of sand or seaweed. They can also appear as a strobe lights, blinking “on an off” very quickly. So extraordinary are these “masters of camouflage” (p. 28) that government researchers are even “looking into the possibility of copying cuttlefish camouflage for use in the military” (p. 31). 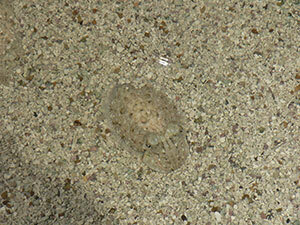 Researchers are enamored with “how cuttlefish achieve their quick and convincing camouflage” (p. 30). Nevertheless, “[i]t’s highly unlikely that anyone could achieve that same level of camouflage” (p. 30). Scientists admittedly find it difficult “mimicking the colour-matching abilities of the cuttlefish...and its texture-matching ability, which utilizes the muscles beneath it” (p. 30). In fact, “[n]o one knows exactly” how cuttlefish match their backgrounds so effectively, especially since “[e]xperiments have shown that cuttlefish don’t look at their skin to check how well it matches the background” (p. 31, emp. added). What’s more, if, as scientists believe, this animal is colorblind, only seeing in shades of green (p. 31), how does it always choose the color most helpful (like changing to the color of sand when on the ocean floor)? Cuttlefish are remarkable creatures. Evolutionists have called the animal a “genius.” Scientists admit that cuttlefish are “sophisticated,” “intelligent,” “tailor-made” creatures with a “secret code.” Yet the very first word Michael Brooks used in his New Scientist article to explain the existence of cuttlefish is “evolution” (p. 29). But how can intelligence arise from non-intelligence? How can something “tailor-made” have no tailor? No one would suggest that Morse code is the product of time and chance, yet Brooks and other evolutionists would have us believe that the cuttlefish’s “secret code” is the product of millions of years of mindless evolution (p. 31)? Preposterous! Nature cannot explain the cuttlefish. The real Code-Giver, the Intelligent Designer Who “tailor-made” the cuttlefish, is God. He “created great sea creatures and every living thing that moves, with which the waters abounded, according to their kind” (Genesis 1:21). Brooks, Michael (2008), “Do You Speak Cuttlefish?” New Scientist, 198:28-31, April 26.